Today was last day at Singapore. Packed everything night before so that after breakfast we can check-out without much wasting of time.It was holiday at Singapore as of some Muslim festival. My plan was to go to Arab Street. This area has beautiful old shop houses that line the streets. 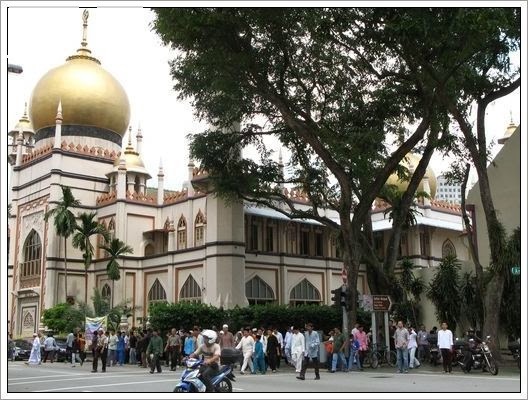 The highlight of the area is the grand Sultan Mosque, which was crowded as people were coming out after prayers.I think Arab Street is known for the fabrics a great place to go if you want or need cut piece. Here you can find materials of every imaginable colors. Not only fabric but also carpet, prayer mats, jewelries oriental carpets, pashminas, sarong, batik shirts etc. I think you can BARGAIN!!!! but not sure. The shops here sell French Lace, Thai silk, Brocade, Indian Silk buttons, and many more...anything related to sewing. 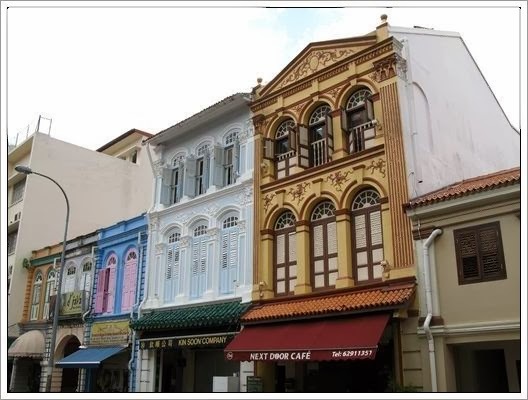 It is a great stop to just walk around and see the shop house architecture of Singapore. Seemingly endless number of fabric shops starts to make your head spin. On Baghdad street-there are a lot of new restaurants/cafe houses. Many of the restaurants have sheeshas or water pipes, which you can smoke while having sip of coffee. 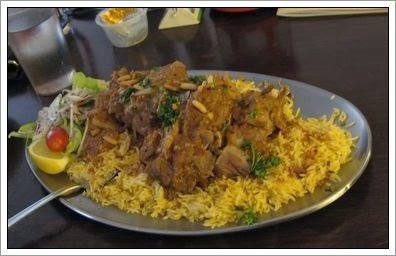 We had kasha laham for lunch at Cafe le Caire @ Al Majlis located at 39 Arab Street which was for more than 2 person in terms of portion. After having heavy lunch we walked towards Bugis street but I missed the charm of it as Santanu was not in mood for any more shopping. Its place for shop-alcoholics with good street shopping experience. 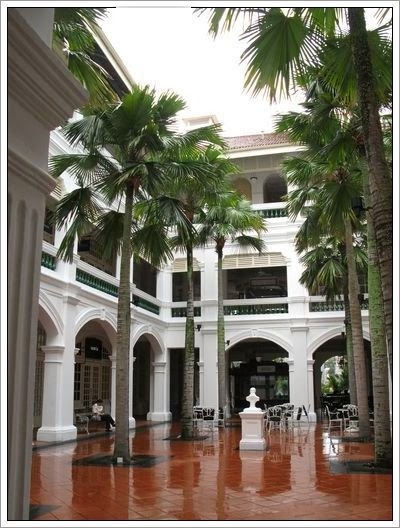 Then came to Raffles hotel to see its colonial style architecture. It houses museum shops, tropical garden courtyard and Victorian-style theater, tiffin room among many others. 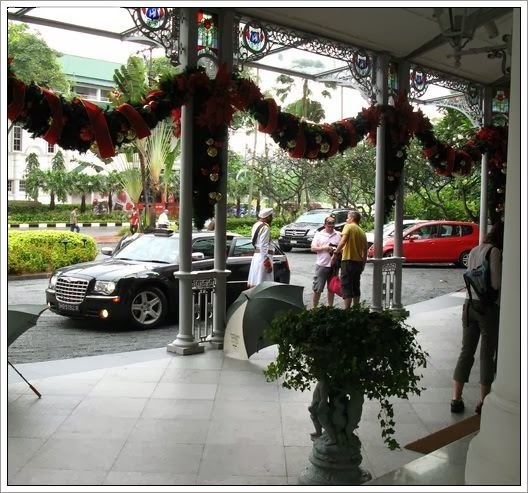 Best part is at raffles you will be first welcomed by a Sikh doorman dressed in white ironed Grieves and Hawks uniforms with thick mustache as you get down from your car. It is impossible to overlook the doorman dressed in traditional Sikh attire. But what is fascinating is the fact that they are one of the most photographed icons of Singapore. Then visited raffles mall and after strolling for a while decided to return to our mandarin hotel as Santanu''s flight was ahead of us. Yes...you heard it right..we had different flight on way back as well. While going from here to Singapore it was smooth journey with Aarush but on way back it was really terrible as flight was fully packed and with time difference and whole day moving around he was cranky enough. With very less leg space he was not getting proper sleep. Then after landing too we have to spend another 2 hrs. at airport as Santanu had phone call meeting.